Watching War Machine is to witness a film applying an accessibly dark comic tone to the low-hanging fruit of the futility of nation-building in Afghanistan. 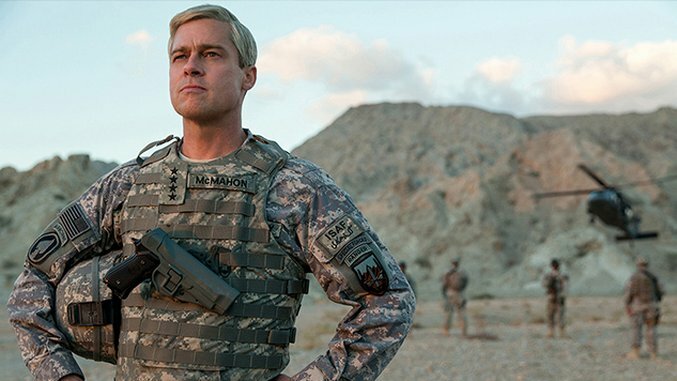 The movie takes place in 2009, when General Glen McMahon (Brad Pitt as a version of Gen. Stanley McChrystal)—fresh off successes in Iraq—is put in charge of the multi-nation, U.S.-led coalition to stamp out the Taliban while molding Afghanistan into what a country should look like according to Western democracies, which, as McMahon describes it, means jobs and security. Our introduction to McMahon comes through a narrator, Sean Cullen (Scoot McNairy), who is based on the late Michael Hastings. It was Hastings’ article for Rolling Stone that led to McChrystal’s ouster, and it was Hastings who wrote The Operators, upon which this film is based. His narration sets the sardonic tone, and every characterization and situation that follows reinforces it. The problem with War Machine is its difficulty keeping its tone consistent in the service of a compelling story or dramatic rendering of ideas. Cullen-as-narrator casually drops that McMahon was a straight-A student with a degree from Yale, while simultaneously characterizing him as a well-meaning jock out of his depth. The way Pitt plays him and Cullen describes him, McMahon is a decent, disciplined jarhead trying to hammer a square peg into a round hole. If you were already inclined to think of our involvement in Afghanistan as an incompetent diaster, War Machine might be your film: Those given charge of transforming the region can’t even make an electric razor or Blu-ray player work. During that same scene, a German politician (Tilda Swinton) gets to make a very long, interrupting, exasperated sermon that speaks for the movie itself: While she believes in McMahon’s basic goodness, she’s sure that he and the coalition are wrong to try to nation-build in a place like Afghanistan, where resistance is spread throughout. For his part, McMahon is aware that he can’t war his way to victory in Afghanistan, but doesn’t entertain the notion that he has any other choice than to try. He’s got a job to do, and he’s foolish enough to take it seriously even though it’s clear that those who gave him the job do not. One didactic scene touching on this Gordian knot has a soldier (an excellent Lakeith David) acting thoroughly confused and frustrated by this “help them, don’t kill them” dictate. When McMahon tells him to get “unconfused,” we’re supposed to see this as yet another example of the general’s inability to deal with complexity and hard facts beyond a certain level. It’s a compelling exchange in a film with some strong moments, such as McMahon telling a rude dinner guest to get lost, or any of McMahon’s touching interactions with his wife (Meg Tilly in an outstanding turn), or the awful aftermath of a battle. But as good as these moments are, War Machine lacks compelling drama, or at least a consistency in tone and formal structure to justify its two-hour running time. Sometimes we’re empathizing with McMahon, and at others we’re expected to laugh at him (especially with the way Pitt crinkles his face like Popeye). He cuts a sympathetic figure because he’s trying to do the right thing amidst politicians—including Obama—whose idea of goals is moving the needle in the right direction, meaning a direction that makes it look like U.S. forces and the people of Afghanistan are “winning.” McMahon wants more troops to make a difference in nation-building; Obama will give him those troops, but only for PR purposes. So we come to understand that the war machine of the title is about having moving parts, not accomplishing anything. This is where the movie exhibits some bite: through McMahon’s interactions with those who can only see Afghanistan in terms of how it affects politicians like Obama back home. One of these, U.S. Ambassador Pat McKinnon (Alan Ruck), expresses a cynicism that runs so deep, and is so transparent, it makes for a couple of alarming and satisfying confrontations between him and McMahon. By frequently reminding us that McMahon is oblivious to what his masters really want, Michôd’s film is as much of a blunt, simple instrument as that which it tries to lampoon. The D.C. suits are the realists, caring only about electability, and McMahon is a cartoon. There’s a benefit to that light touch, as it keeps the movie from being consumed by self-seriousness, but by making McMahon the jokey center of the film, Michôd seems to let the D.C. establishment of the hook. This appears to be true of War Machine’s final image, where the telling of a joke ends up taking precedence over what the joke is meant to reveal. In the right context, that punch line could be a real kicker. Here, it needs a way better set-up.